Use Accessory Bits for tight, inside curves and to drill holes. The Braze Bond Process envelopes the diamonds and holds them tight to the stainless steel core. As the bit wears down, more diamond surface is exposed. Electroplated diamonds are less effectively held to a brass core by a plating process. This will leave gaps in the bond, causing diamonds to be shed as the bit wears down, giving a much shorter useful life. BONUS FEATURE: These Durabits can also function as a core drill. The hollow grinding surface will allow you to drill holes. Just be sure to keep your work wet for best results and longer diamond life. 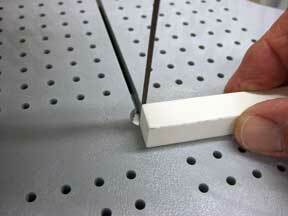 Use fine grit bits when working with soft glass or to get a smooth finished edge. Certified Safe for use with fused glass. Use to attach the above grinding bits to Glastar SuperStar II and DiamondStar Grinders as well as all Inland, Gryphon and red Diamond Tech grinders. Bits screw into threaded opening at the top. Adapter slides onto exposed upper shaft on the grinder and is held in place with the set screw. Use only with Glastar 1/4 and 1/8" bits. These bits slide over the top of the shaft on all Inland, Glastar, Gryphon and red Diamond Tech Grinders.